Douma in Syria. Site of suspected chlorine attack on Saturday 7th April. Damascus: Russia and Syria last night accused Israel of conducting missile strikes on the Syrian military airport at Tiyas after the US, France, Britain and Germany warned of a strong response to "horrific chemical weapons attacks" on a rebel-held enclave near Damascus. Moscow said two Israeli F-15 fighter bombers and missiles fired remotely from Lebanese territory had struck the central T-4 air base early Monday. Syria State News Agency SANA first said the missile strike on the T-4 base was a "suspected US attack", but later withdrew all reference to the US. A military spokeswoman for Israel, which has bombed Syrian regimen positions including those linked to chemical weapons, declined to comment. Syrian state news agency SANA said "several missiles" had hit the T-4 airport, later adding that there were "dead and wounded". The Syrian Observatory for Human Rights said "at least 14 fighters" were killed, including Iranian forces allied to the Assad regimen. Washington and France denied responsibility for the strike, which came just hours ahead of an urgent UN meeting to be held early today over the use of toxic gas on Saturday on the town of Douma in Eastern Ghouta that killed at least 60. Excerpt same day from a separate report: Residents said the gas was dropped on homes at 7pm on Saturday 7th April. The toxic clouds, twice as heavy as air, sank through the buildings, killing many trapped in makeshift basement shelters, where they had fled to escape conventional air strikes by Syrian government forces. "More than half of the dead are children. People died in their houses and in their basements as they tried to hide," Mohamed Hassan, a local reporter who helped with the rescue efforts said. "In one house I saw a mother and three babies, all were dead. The mother was on top of them trying to protect them. They all had foam on their mouths. They seemed to have struggled a lot before they died," he added. Photographs and videos taken inside the houses in Douma yesterday revealed piles of bodies, many of them babies, all with the telltale white foam around their mouths. Footage from hospitals showed doctors hosing down children who struggled to breathe. Hours after the Saturday attack, Syrian media and Douma negotiators confirmed that rebels had agreed to relinquish the town. A preliminary deal last week had seen hundreds of civilians and rebels from Jaish al-Islam quit Douma. After days of talks and a respite from bombing, talks collapsed and strikes resumed on Friday, killing nearly 100 people. On Sunday, Moscow said all military operations around Douma had halted and that 100 buses had arrived in town to help start ferrying out 8,000 fighters and 40,000 of their family members. US President Donald Trump and his French counterpart, Emmanuel Macron, spoke by phone and vowed a "strong, joint response" to the chemical attack. The White House, along with the leaders of Britain and Germany, said the regimen of Bashar al-Assad "must be held accountable for its continued human rights abuses". Mr Trump had earlier issued a blistering warning to the Syrian regimen and its allies Russia and Iran via Twitter. Damascus and its allies denounced the accusations, with the Syrian regimen brushing them off as an "unconvincing broken record". Russia's Foreign Ministry called the accusations a provocation. "A military intervention under far-fetched and fabricated pretexts in Syria, where there are Russian soldiers at the request of the legitimate Syrian government, is absolutely unacceptable and could have the most dire consequences," it said. Foreign Minister Sergey Lavrov said Russian military had visited the site of the suspected poison gas attack and had not found any evidence to back up earlier reports. Military officials quoted a doctor and an ambulance driver in Douma hospital who both said they had not received anyone with symptoms of chemical poisoning. Kremlin spokesman Dmitry Peskov suggested the attack could have been staged by rebels to pin the blame on Damascus. Syria medical relief group the Union of Medical Care Organisations, a coalition of international aid agencies that funds hospitals in Syria, said: "The numbers keep rising as relief workers struggle to gain access to the subterranean areas where gas has entered and hundreds of families had sought refuge." 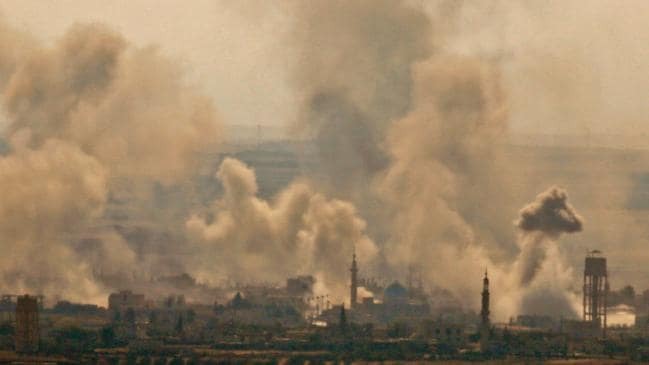 Regime forces, backed by Russia, have pounded Eastern Ghouta in a seven-week assault to dislodge rebel fighters, killing more than 1700 civilians and prompting tens of thousands to flee. The chemical attack on Douma prompted international anger, with UN chief Antonio Guterres saying any confirmed use of chemical weapons would be "abhorrent". The EU said "the evidence pointed towards yet another chemical attack by the regimen", while Turkey stated it had a "strong suspicion" Assad was to blame. Iran came to Assad's defence, saying the allegations were a Western conspiracy and echoing Russia's warning against foreign military action. The Trump administration worked Tuesday to rally international support for a possible military strike against Syrian President Bashar al-Assad for an alleged chemical-weapons attack, drawing initial backing from France, the UK and Saudi Arabia, who vowed a forceful response. As President Donald Trump and top administration officials conferred with international counterparts, the US and France positioned guided-missile destroyers within firing range of Syria. Mr Trump, at the urging of his national security team, canceled plans to travel Friday to Latin America for a regional summit so that he can oversee the US response. defence Secretary Jim Mattis also rearranged his travel schedule, putting off a planned trip to the West Coast. Mr Trump has vowed to punish Russia and Iran if the US concludes they helped with the strike that killed more than 40 people, including women and children. But there was no indication that the US would target Russian and Iranian forces in Syria. Instead, the US and its allies are looking at ways to cripple Mr Assad's ability to carry out more chemical attacks. French President Emmanuel Macron said strikes could target the Syrian regime's chemical-weapons storage facilities. Mr Macron said he expected the small group of leaders crafting a response to take action "in the coming days." Joining Mr Macron on Tuesday for talks in Paris was Saudi Arabia's day-to-day ruler, Crown Prince Mohammed bin Salman, who pledged his country's support for the evolving US plans. Prince Mohammed suggested the kingdom could participate in any military action taken against the regime, though it remains unclear what role his country would play. "If our alliance with our partners requires it, we will be present," he said at a joint news conference with Mr Macron. Prime Minister Theresa May, who spoke with Mr Trump on Tuesday, wouldn't say explicitly that Britain would join in any military response. "We believe that those responsible should be held to account," she said. The prospects for a US-led strike increased on Tuesday after Russia vetoed a US-crafted resolution before the United Nations Security Council that called for creation of a new group to investigate chemical attacks in Syria and determine who carried them out. Nikki Haley, US ambassador to the United Nations, said the vote marked a decisive moment in the Council's history to hold perpetrators of chemical attacks accountable and the council had failed due to Russia's repeated vetoes. Russia accused the US of using the debate as a pretext for military strikes. And Russia's United Nations ambassador, Vassily Nebenzia, warned Tuesday of the "confrontational potential" of what he termed an "illegal military venture." On Twitter Wednesday morning, President Donald Trump said that US missiles "will be coming" to Syria, and warned he was willing to challenge Russia directly in launching a military strike against Syrian President Bashar al-Assad over an alleged chemical-weapons attack. 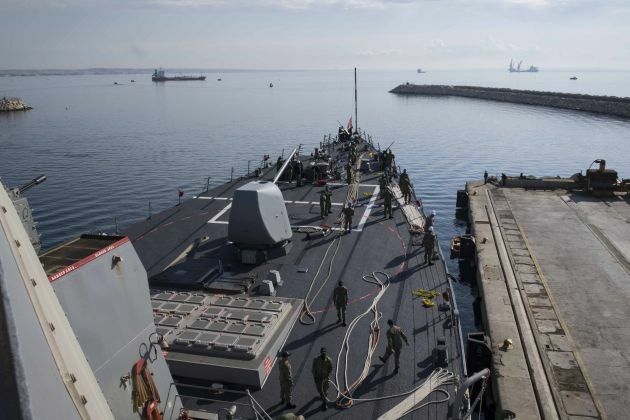 The US and France have positioned warships armed with cruise missiles within firing range of Syria, and the US has been working to rally international support for a strike. The president appeared to be responding to reported comments by the Russian ambassador to Lebanon, Alexander Zasypkin, who told a television channel run by Hezbollah early Wednesday that Russia would shoot down any missiles targeting Syria, "and even the sources from which the missiles were fired." A spokeswoman for Russia's Foreign Ministry said in response to Mr Trump's tweet that Washington should direct its rockets at terrorists in Syria, not the lawful government fighting them. Maria Zakharova also suggested that a US strike could be directed at targets inside Syria to cover up a lack of evidence of the suspected chemical attack "so that international experts have nothing to search for as evidence." The exchanges came in a day of fast-paced developments visible to the public while strategists hashed out plans and held consultations behind closed doors. In a phone call Wednesday, Russian President Vladimir Putin called on Israeli Prime Minister Benjamin Netanyahu not to take steps that would increase instability in Syria, a statement from the Kremlin said. Mr Netanyahu reiterated that he wouldn't allow Iran to establish a military presence in Syria, according to a statement from his office. A Russian lawmaker said Moscow was in direct contact with top US military officials. "Governmental military, diplomatic and political bodies are already working around the clock for the third day in a row," said Vladimir Shamanov, head of the committee for defence at the state Duma, or lower house of parliament, on state television. He added that Russia "is in direct dialogue with the leadership of the US Joint Chiefs of Staff." Russia's navy, meanwhile, began an exercise with rocket launches off the coast of Syria Wednesday, an aviation body said, posing new complications to US plans for a strike. The Cyprus Aeronautical Information Services said Russian Armed Forces had announced the training in the east Mediterranean, which was also reported by Russian media, where Cypriot planes regularly fly until April 26. The defence Ministry didn't respond to questions for comment. Russia currently has approximately 15 ships in the waters off Syria armed with anti-aircraft and cruise missiles meant to protect Syria's coasts as well as a Russian naval station near the city of Tartous. Syria on Wednesday said it had moved many of its aircraft to safer locations, on Russian-operated bases. Russia has broadly supported Damascus's description of the array of groups fighting Mr Assad as terrorists. 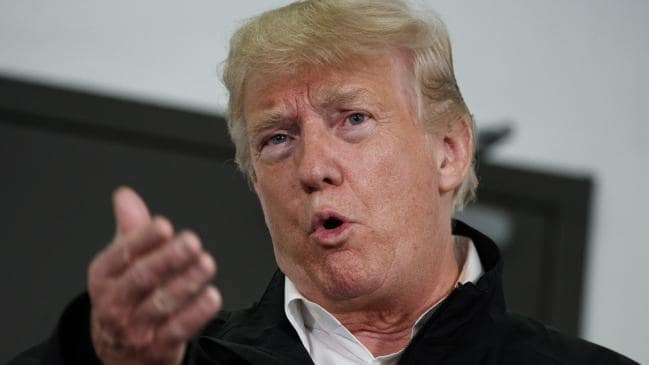 Mr Trump has vowed to punish Russia and Iran if the US concludes they helped with the weekend strike that killed more than 40 people, including women and children. But there was no indication that the US would target Russian and Iranian forces in Syria. Medical professionals and human-rights groups say that Syrian military helicopters dropped weapons containing poison gas that caused symptoms consistent with exposure to chlorine and a nerve agent. Dozens of people, including families hiding in their basements, died and hundreds were injured. The Syrian government has denied involvement, but faced with growing international pressure, offered with Russia to allow a fact-finding team into the country to investigate the attack. The US said it had little confidence in the offer, saying that those countries initially blocked access to the site of the alleged attack and that some of the evidence might have been destroyed. Palestinians clashed with Israel's military on Friday, throwing Molotov cocktails and planting explosive devices at the fence dividing the Gaza Strip and Israel, as thousands gathered again despite the past two demonstrations turning deadly. One person was killed and some 700 Gazans were treated for injuries, including 163 from live fire, Palestinian authorities said. The Israeli army, which responded with gunfire and riot-dispersal means, said about 10,000 Palestinians protested Friday, compared with some 20,000 last week, the army said. About 30,000 demonstrated the Friday before. The organizers this week didn't actively encourage Gazans to come out en masse, instead looking to next month when they plan a big march on May 15 for what Palestinians call "Nakba Day", or "Day of the Catastrophe", marking the day after the anniversary of Israel's founding. The Israeli army said militants on Thursday left a device on the border fence that exploded on a military vehicle, prompting it to mount airstrikes on Hamas targets. One Hamas operative died in the strikes, Hamas-affiliated media reported. Gaza's economy is in dire condition and Palestinian Authority President Mahmoud Abbas, who governs in the West Bank, has put financial pressure on the strip to encourage Hamas to cede control. The Israeli military this week said it had launched an investigation into a video in which Israeli soldiers are heard cheering as a Palestinian appears to be shot at a demonstration in the Gaza Strip. The military said the video was filmed at a demonstration that took place in December after the White House announced it would recognize Jerusalem as Israel's capital and move the US Embassy there from Tel Aviv. The video was widely circulated on social media this week and came as the Israeli military already faced international calls for an investigation into whether it used unlawful force in recent weeks in dealing with Palestinians at the Gaza fence. In total, Palestinian authorities have said at least 30 people, including a journalist with a flak jacket marked "Press", have been killed in demonstrations since March 30 and more than 2,500 injured, with roughly 1,000 from gunfire. Israel faced criticism this week for shooting dead the journalist and later saying the Palestinian was a captain in the Hamas military leadership. The journalist's family denied the accusation and said the US Agency for International Development had recently vetted his media company and offered it a grant only last month. The US and allies Britain and France have launched air attacks, including missiles, on Syria in retaliation for the Assad government's use of chemical weapons, amid a dramatic announcement by Donald Trump. Syria has responded with unspecified anti-aircraft defences (after the bombs landed) and also a statement. The three allied nations are assessing the results of what the Pentagon says is a limited action. "Again, we are being threatened," Russia's ambassador to the US, Anatoly Antonov, said in a statement. "We warned that such actions will not be left without consequences. All responsibility for them rests with Washington, London and Paris", Mr Antonov said. "Insulting the President of Russia is unacceptable and inadmissable" added the envoy, after President Donald Trump directly called out his Russian counterpart Vladimir Putin over his support for the Assad government. Syria's government said the joint attack is a "flagrant violation" that is "doomed to fail". The US says it and its allies waged more than 100 strikes on Syria in a "one time shot" that the Pentagon says followed conclusive evidence that Syrian President Bashar al-Assad was responsible for a chemical weapons attack using at least chlorine gas. US defence Secretary Jim Mattis and Marine General Joseph Dunford, meanwhile, say three main chemical weapons facilities were targeted by both missiles from the sea and fired from aircraft, which triggered Syrian air defences. The Pentagon could not confirm how many missiles hit their targets. In fact, as learned later, all did. Mr Mattis and General Dunford acknowledge the strike was designed to degrade Syria's chemical weapons capability without killing civilians or the many foreign fighters in Syria's multi-sided civil war, particularly those from Russia. "We specifically identified these targets to mitigate the risk of Russian forces being involved," General Dunford tells reporters, adding the US military advised Russia of airspace that would be used in the strike but did not "pre-notify them". Mr Mattis acknowledges the US waged the attacks only with conclusive evidence that chlorine gas was used in the April 7 attack in Syria. Allegations of Mr Assad's chlorine use are frequent in Syria's conflict, raising questions about whether Washington had lowered the threshold for military action in Syria by now deciding to strike. Last year, the US only waged strikes on Syria after determining that more deadly sarin gas was used. Some US media had reported that Washington was confident Mr Assad had also used sarin on April 7. Mr Mattis, however, suggests the evidence of sarin is so far inconclusive. "We are very confident that chlorine was used. We are not ruling out sarin right now," Mr Mattis says. The Pentagon says one of the targets was a scientific research centre located in the greater Damascus area, which it says was involved in the development, production and testing of chemical and biological weaponry. The second target was a chemical weapons storage facility west of the city of Homs. "We assess that this was the primary location of Syrian sarin and precursor production equipment," General Dunford says. Iran's supreme leader Ayatollah Ali Khamenei denounced US President Donald Trump, France's Emmanuel Macron and Britain's Theresa May. "The attack this morning against Syria is a crime," Khamenei said in remarks published on his Telegram channel. "The American president, the French president and the British prime minister are criminals." British air strikes on a Syrian base on Saturday have been "highly successful" according to early indications and the crews of the four British fighter jets involved have returned safely, Defence Secretary Gavin Williamson said. Israeli missiles hit air defence positions and other military bases, in Damascus. Picture: Syrian Central Military Media, via AP. Jerusalem: Israel, in a pre-dawn raid Thursday morning, attacked "dozens" of Iranian targets in neighbouring Syria in response to an Iranian rocket barrage on Israeli positions in the Golan Heights, in the most serious military confrontation between Israel and Iran to date. Israeli military spokesman Jonathan Conricus said Israel was not looking to escalate the situation. But Lieutenant Colonel Conricus said troops would continue to be on "very high alert". "Should there be another Iranian attack, we will be prepared for it," he said. Israel is suspected of striking an Iranian outpost near Damascus late on Tuesday, killing 15 people, at least eight of them Iranians. Just after midnight on Thursday morning, Israel said Iran's Al Quds force fired 20 rockets at Israeli frontline positions in the Golan Heights. According to Colonel Conricus, four of the missiles were knocked down by the Iron Dome air defence system and the rest failed to reach Israeli territory. The Israeli mission in response — the largest air campaign carried out in Syria in over 40 years ever since a disengagement agreement was signed after the October war of 1973 — was ?very successful,? a senior air force officer said. Israel said the targets included weapons storage, logistics sites and intelligence centres used by Iranian forces in Syria. It also said it destroyed several Syrian air defence systems after coming under heavy fire and that none of its warplanes was hit. Since the civil war broke out in Syria in 2011, Israel has largely tried to stay on the sidelines, but has previously acknowledged carrying out more than 100 airstrikes over the past seven years, most aimed at Iranian weapons shipments bound for Hezbollah. With the civil war winding down and Iranian forces looking to establish a foothold on Israel's doorstep, Israel has stepped up its response. Defence Minister Avigdor Lieberman said Israel would respond fiercely to further Iranian actions. "We will not let Iran turn Syria into a forward base against Israel. This is the policy, a very, very clear policy, and we're acting according to this policy," he said. "We … struck almost all Iranian infrastructure in Syria; they need to remember this arrogance of theirs. If we get rain, they'll get a flood. I hope we ended this chapter and that everyone understood." Iranian media described the pre-dawn Israeli attack as "unprecedented" since the 1967 Mid-east war. 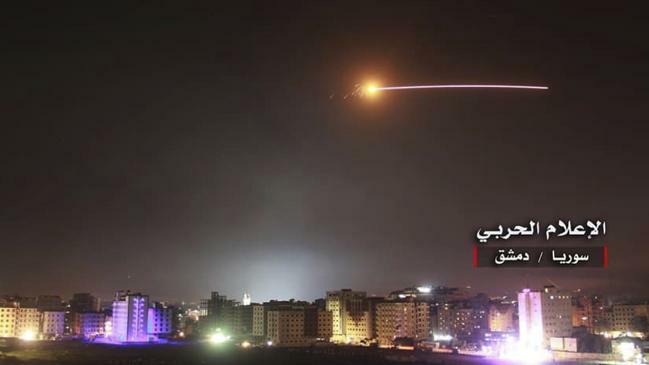 News agency SANA said Israeli missiles hit air defence positions, radar stations and a weapons warehouse in southwestern Damascus. Activists said the onslaught lasted more than five hours. TV said Israel also targeted posts in southern Suweida province, including an air base, and struck near central Homs. In recent months, Israel has warned that it would not accept a permanent Iranian presence in Syria. Iran has accused Israel of carrying out a series of deadly strikes on Iranian positions in Syria in recent weeks, and had vowed retaliation. Iran has sent thousands of troops to back Syrian dictator Bashar al-Assad, and Israel fears that as the fighting nears an end, Iran and tens of thousands of Shia militiamen will turn their focus on Israel. Israeli Prime Minister Benjamin Netanyahu met Russian President Vladimir Putin in Moscow on Wednesday to discuss military co-ordination in Syria. Russia has also sent forces to back Assad. Israel and Russia have maintained communications to prevent their air forces from coming into conflict. After 10 hours with Mr Putin, Mr Netanyahu said he conveyed Israel's obligation to defend itself against Iranian aggression. Benjamin Netanyahu urged world leaders to follow the US example and move their embassies to Jerusalem, claiming that recognising the city as the capital of Israel would be the first step to peace. 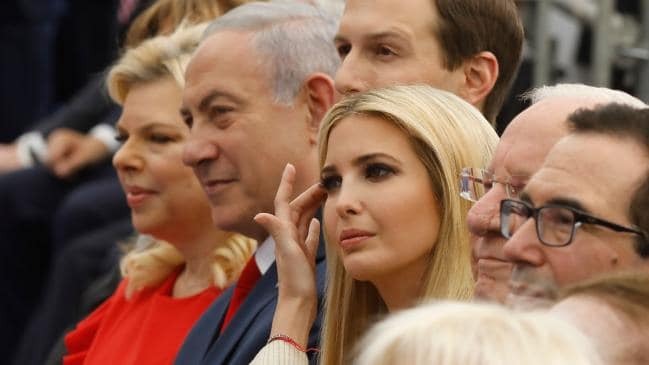 Hours before the new US embassy opened in Jerusalem late last night, Mr Netanyahu thanked Ivanka Trump and the rest of the US delegation for strengthening the alliance with Washington. Meanwhile, as thousands of Israelis took to the streets to celebrate Mr Trump's decision, thousands of protesters gathered at the Gaza border. The embassy was opened a day before the 70th anniversary of the Nakba, or "catastrophe", when Palestinians mourn the establishment of the state of Israel, which forced hundreds of thousands to flee their ancestral homes. The status of Jerusalem is one of the most inflammatory issues in the decades-long Israeli-Palestinian conflict, as the city is claimed by both sides as their capital. Since the creation of Israel in 1948, the UN has defined Jerusalem as an international city due to the religious significance it holds for Jews, Muslims and Christians. Most of Europe has opposed the US embassy move. Only four ambassadors from the EU decided to attend the inauguration overnight — Austria, the Czech Republic, Romania, and Hungary. The US embassy was opened by a delegation including Ms Trump, her husband, Jared Kushner, and Treasury Secretary Steven Mnuchin. At a ceremony yesterday, Mr Netanyahu said: "I call on all countries to join the US in moving their embassies to Jerusalem. It's the right thing to do … because it advances peace." Mr Mnuchin replied: "The US has no greater partner than Israel — nothing is more important." Despite the growing violence and fears it will end any attempts at a fresh peace process, Mr Netanyahu's popularity in Israel has soared. In February many believed he was weeks away from being forced out of office, after the police recommended he be indicted on two corruption charges. But last week a poll cited by Army Radio said if elections were held now his Likud party would win 42 seats, a significant rise on the 30 seats it presently holds in the Knesset. A Hadshot TV news survey said Likud would secure at least 35 seats. Israel has experienced improved relations with the US after a frosty period under Barack Obama. Buildings around the new embassy are covered with posters saying Mr Trump "is a friend of Zion", and the city's mayor said the street opposite the embassy would be named after the US leader. Israeli Construction Minister Yoav Galant said: "We are very lucky that the strongest kid in the classroom is our friend. We don't have a friend outside of the US. This is very important." The White House has blamed Hamas for violent protests in Gaza on Monday that saw 55 Palestinians killed and thousands injured by Israeli forces, saying the Jewish state has the right to defend itself. "The responsibility for these tragic deaths rests squarely with Hamas," White House spokesman Raj Shah said, refusing to call on Israel to show restraint. The deadliest day in the Israeli-Palestinian conflict since a 2014 war between the Jewish state and Gaza's Islamist rulers Hamas came as US President Donald Trump hailed the opening of the US embassy in Jerusalem as "a great day for Israel". In the wake of the clashes, Turkey and South Africa recalled their ambassadors, with Turkish President Recep Tayyip Erdogan accusing Israel of "state terror" and "genocide", and the South Africa government blaming "violent aggression" by the Israeli armed forces against peaceful protesters. Mr Erdogan also announced three days of national mourning over the deaths, as well as a giant protest in Istanbul on Friday. "Israel is wreaking state terror. Israel is a terror state," Mr Erdogan told Turkish students in London in a speech broadcast by state television. "What Israel has done is a genocide. I condemn this humanitarian drama, the genocide, from whichever side it comes, Israel or America," he added. In a response statement, Netanyahu said that "Erdogan is among Hamas's biggest supporters and there is no doubt that he well understands terrorism and slaughter. I suggest that he not preach morality to us." Turkey furthermore requested that Israel's ambassador to Ankara, Eitan Na'eh, temporarily leave the country. In response, Israel expelled Turkey's consul to Jerusalem. Consul-General Husnu Gurcan Turkoglu, who represents Turkey to the Palestinian Authority, with Turkey's Consulate-General in Jerusalem having opened back in 1925, was summoned to the Israeli Foreign Ministry and told to leave the country. The move was extraordinary in that Israel rarely interacts with foreign diplomats dealing exclusively with the Palestinians. Head of Protocol Meron Ruben told Turkoglu that he was "requested to return to his country for consultation for a certain period of time," Foreign Ministry spokesperson Emmanuel Nahshon said. Turkey on Tuesday night then ordered Israel's consul general in Istanbul, Yossi Levi Sfari, to leave the country, the Foreign Ministry confirmed. Mr Shah insisted the latest violence would not impact the administration's peace plan for the region. "The peace plan will be brought forward at the appropriate time, it can be evaluated on its merits," he said. "The actions today — both the opening of the embassy in Jerusalem and these tragedies in southern Israel — we don't think it will impact the peace plan." Lieutenant Colonel Jonathan Conricus, spokesman for the Israeli Defence Forces, cast doubt on the casualty numbers from the Hamas-controlled Health Ministry, saying a large number of the injured had only suffered gas inhalation. He had said ealier the army was expecting protesters to try to breach Israel's border, and it had deployed three additional infantry brigades to the borders of the Gaza Strip and West Bank. About 1000 police were positioned around the US embassy after scuffles on the Temple Mount between Israelis and Muslim security forces. The Prime Minister said the loss of life was "tragic" but Hamas was to blame for pushing people to the border with Israel. "Any loss of life like this is tragic in circumstances like this, but Hamas' conduct is confrontational. They're seeking to provoke the Israeli defence forces," Mr Turnbull told 3AW Radio. "If they're pushing people to the border in that context, in that conflict zone, you're basically pushing people into circumstances where they are very likely to be shot at as Israel seeks to defend itself." Australia also joined France and Germany in urging restraint but Foreign Minister Julie Bishop said Israel had to protect its population and urged Palestinians to refrain from violence. "We recognise that Israel has legitimate security concerns and needs to protect its population, and we call on Israel to be proportionate in its response and refrain from excessive use of force," Ms Bishop said in a statement. "Australia urges Palestinian protesters to refrain from violence and attempting to enter into Israeli territory during the March of Return." Mr Turnbull again ruled out following the US to move the Australian embassy to Jerusalem. Former Prime Minister Tony Abbott repeated his call for the embassy to be moved on Twitter. The US embassy is now in West Jerusalem, which has been Israel's capital for nearly 70 years. Australia should consider following Trump's move. In their response, Labor leaders instead focused on urging Israeli authorities to show restraint. "I think it's dreadful what we've seen. In particular, when you see the death of children, no good comes of that. No good comes of that at all. That's a disaster. So we are urging restraint from Israel," Labor Leader Bill Shorten said. "We also support a two-state solution, and we believe that aggression from any party puts back the cause of peace." Labor foreign affairs spokeswoman Penny Wong said Labor supported the right of peaceful protestors. "The deaths and injuries of Palestinian protesters in Gaza overnight are both shocking and tragic," she said in a statement. "Labor urges Israel to show restraint. We support the right for peaceful protest and call on both sides to deescalate tensions." Cairo: Egyptian President Abdel Fattah el-Sisi has made a rare decision to open the Rafah crossing with Gaza for a month, allowing Palestinians to cross during the holy period of Ramadan. The decision to keep the crossing open was taken "to alleviate the suffering" of residents in the Palestinian enclave, Mr Sisi said on Facebook yesterday. The Rafah crossing is Gaza's only gateway to the outside world not controlled by Israel, but Egypt has largely sealed it in recent years, citing security threats. The last extended opening lasted three weeks in 2013, while usually Palestinians are able to cross for a few dozen days a year. Previous openings of Rafah have been cut short by violence in the Sinai peninsula. Mr Sisi's announcement comes after 62 Palestinians were killed by Israeli fire on Gaza's frontier earlier this week, with the victims described by Egypt's Foreign Ministry as "martyrs". A total of 114 Gazans have been killed in protests and clashes since March 30, in the run-up to the opening on Monday of the US embassy in Jerusalem. Egypt has relations with Israel and Gaza rulers Hamas, giving Cairo a key role in easing tensions between the two and alleviating the pressure on the territory's two million residents. Hamas leader Ismail Haniya last Sunday visited Egypt, where he met the director of the country's intelligence services, Abbas Kamel. An emergency summit of the Organisation of Islamic Co-operation was to be held in Istanbul last night. Turkish President Recep Tayyip Erdogan has vowed the meeting should send a "strong message to the world" over Israel's treatment of the Palestinians. At an Israeli checkpoint yesterday, Palestinians were crossing from the West Bank town of Bethlehem to the first weekly prayers of Ramadan at Jerusalem's Al-Aqsa mosque compound. Gaza City: Gaza's Hamas rulers said yesterday they had agreed to a ceasefire with Israel to end the largest flare-up of violence between the sides since a 2014 war. Senior Hamas official Khalil al-Hayya said Egyptian mediators intervened "after the resistance succeeded in warding off the aggression". He said militant groups in Gaza would commit to the ceasefire as long as Israel did. Israeli cabinet minister Arieh Deri told Israel's Army Radio he expected calm to be restored. "If it will be quiet, we will respond with quiet. We've given Hamas a chance to prove that we can return to routine … If they release the reins there will be a very painful strike," he said. "There is a good chance that the routine will be restored after the blow the army unleashed on them." The Israeli military struck dozens of militant sites in Gaza during the previous night as rocket fire continued towards southern Israeli communities, setting off air-raid sirens in the area. The military said it hit drone-storage facilities, military compounds, and rocket and munition workshops across the Gaza Strip. The Hamas rocket fire reached the city of Netivot for the first time since the 2014 war. A home was struck, but no one was wounded. After Gaza militants fired about 30 mortar shells on Tuesday, Israel responded fiercely, threatening to set off another round of confrontations. The Israeli military said most of the projectiles fired on Tuesday were intercepted, but three soldiers were wounded. One mortar shell landed in a kindergarten shortly before it opened, wounding one person. Brigadier-General Ronen Manelis, the chief military spokesman, threatened tougher action and said it was up to Hamas to prevent the situation from escalating. Beirut: Russia and Israel have come to an extraordinary agreement over the role of Iranian troops in Syria, paving the way for a regime offensive against one of the last rebel-held areas in the south of the country. Russia has agreed to Israeli demands that Iranian-backed militias be held back from the border with the occupied Golan Heights, according to Israeli television. A separate report in a Saudi newspaper said the regime had agreed that Iranian militias would stay 25km away. Moscow has also agreed not to try to stop Israeli bombing raids on Iranian bases and militias elsewhere in the country. In return, Israel will not try to stop Syrian President Bashar al-Assad's forces retaking the rebel-held areas next to the Golan Heights and the nearby Jordanian border. Israeli Defence Minister Avigdor Liberman flew to Moscow on Wednesday night to meet with his Russian counterpart Sergei Shoigu. "The primary focus of the defence establishment is preventing the entrenchment of Iran and its proxies in Syria," Liberman wrote in a tweet before his flight. The deal is said to have been finalised in a telephone call last Friday between Lieberman and Shoigu, and follows a visit to the Kremlin this month by Israeli Prime Minister Benjamin Netanyahu. Thanks to the agreement, Russia will be able to support a regime advance on southwest Syria, where rebels hold a stretch of territory from the border by the Golan Heights through the city of Daraa to a point on the Jordan border. The fate of Daraa, once called the "cradle of the revolution", has been the subject of secret talks for months. The area is covered by a "de-escalation zone" negotiated between the US and Russia last year, meant to reassure Jordan and Israel that the war would not reach their borders. However, the Assad regime wants to regain control over all its territory; Daraa is an easier target than Idlib, the other main rebel pocket. Russian Deputy Foreign Minister Mikhail Bogdanov said yesterday Moscow, the US and Jordan would meet to discuss the future of the Daraa de-escalation zone. A rebel official said Syria and Iran had never approved of the de-escalation agreement and were determined to break it. Israel has carried out its biggest attack against Hamas militant targets in Gaza since the war in 2014, Prime Minister Benjamin Netanyahu says. The raids were a response to rockets fired into Israel, he said. Hamas said a truce had been agreed, but further exchanges have been reported. Palestinian health officials said two people were killed and 12 injured in an air strike in Gaza City on Saturday. Three Israelis were hurt by one of the rockets fired on Israel. More than 200 projectiles — including rockets and mortars — had been fired into Israel since Friday, the Israel defence Forces (IDF) said. 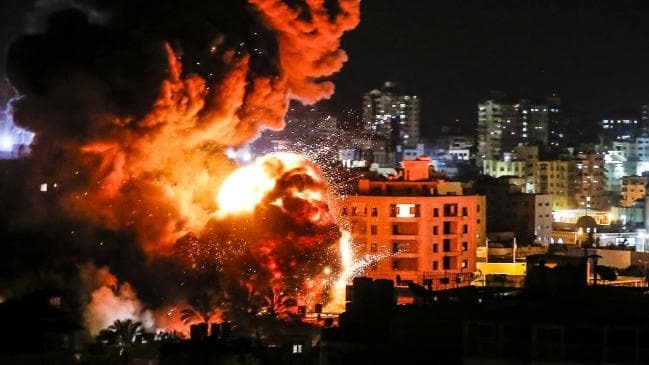 The IDF said it had struck facilities used by Hamas, which dominates Gaza, including a battalion headquarters in Beit Lahia, a training camp located in a high-rise building in the al-Shati refugee camp in northern Gaza, weapons storage facilities and rocket launchers. "In consultation with the minister of defence, the chief of staff and the top security command of the state of Israel, we have decided on strong action against Hamas terrorism," Mr Netanyahu said in a video statement. "The IDF have struck Hamas with the hardest blow since Operation Protective Edge and we will increase the strength of our attacks as necessary," he added, referring to the 2014 conflict. However, Palestinian officials said a ceasefire had now been agreed thanks to "Egyptian and international efforts". Israel has not commented on the report, although Reuters quoted an unnamed Israeli defence official as saying "only the facts on the ground will dictate our further response". Witnesses told Reuters news agency an Israeli strike had hit an empty building in Gaza City and that the casualties were passers-by. Hamas said another Palestinian had died after being shot by Israeli troops during border protests on Friday. The IDF said dozens of rockets had been fired on Israel from within Gaza. More than 90 rockets are reported to have fallen in Israel. One rocket hit a home in the town of Sderot. Three people suffered shrapnel wounds. Iran and Israel were heading towards a direct confrontation in one of the most keenly contested territories in the Middle East, as forces loyal to the Assad regime and Tehran routed rebels in Syria. The advance brings the Middle East's fiercest enemies within sight of each other for the first time since the Syrian war began, an outcome feared by Israel. The Syrian army, supported by Iranian militias, was pushing towards the Golan Heights, a strip 40 miles west of Damascus snatched by Israel in 1967. The Golan remains contested but under Israeli control. For the past six years it has been buttressed on the Syrian side by rebels and hard line jihadist groups, including Islamic State. The latest assault began as Hossein Jaberi Ansari, an Iranian foreign ministry official, met President Assad in Damascus on Sunday. The two sides reaffirmed their commitment to co-operation in the conflict. President Assad's forces are pushing into the rebel pocket next to the Israeli border from the east, after their victory in neighbouring Deraa last week. Militias linked to Iran, including Lebanese Hezbollah, maintain bases in the area east of Damascus and are fighting alongside the Syrian army, which has been weakened by years of fighting and cannot operate independently. Benjamin Netanyahu, the Israeli prime minister, has been trying to forge a deal with Russia, Assad's other key ally, to keep Iranian-linked troops away from the Golan in return for holding fire as the regime advances. Mr Netanyahu has urged President Trump to push for the agreement during his talks with President Putin. Russian jets were aiding the advance of the regime and militias yesterday. The regime is making quick progress through the rebel-controlled region of Quneitra, taking several villages yesterday. By the afternoon it had captured Tel Masharah, which overlooks Israeli territory, and the village of Ain al-Tinah, four km from the frontier. The fighting can be seen from the Golan Heights, with huge plumes of smoke and dust from Russian bombardments and about 20,000 people displaced by the fighting flocking to the border in search of safety. Israel has treated injured Syrians. Under a UN-brokered agreement in 1974, the Syrian military cannot enter a buffer zone along the Golan border. "The worst-case scenario is that Iran and Hezbollah will have control over Syria, and especially on our border," Lieutenant Colonel Sarit Zehavi, a former intelligence specialist in the Israel defence forces, said. "That way no one will be able to stop them from establishing a military infrastructure on the Israeli border." 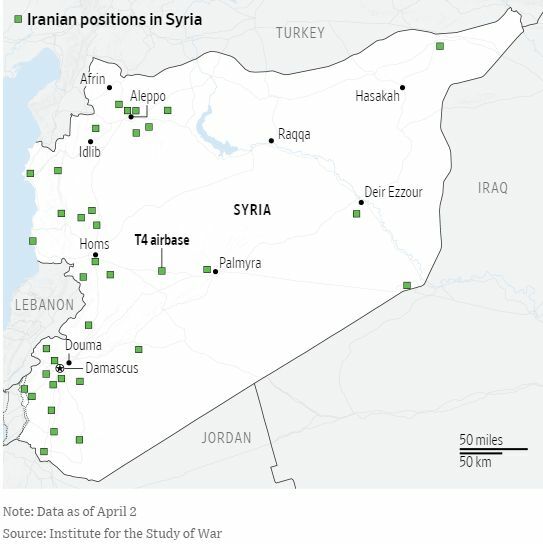 Although Tehran is opaque about the number of troops it has deployed in Syria and about its relationship with Shia militias fighting alongside Assad's forces, it has been expanding its presence there since late 2015. There are now believed to be more than 10,000 Iran-linked militiamen in Syria, and parts of the Syrian army are linked to the Iranian military command. The local defence forces, known as Syrian Hezbollah, includes commanders from Iran's Islamic Revolutionary Guard Corps. Tehran is adamant that it will keep its military advisers in the region as a bulwark against Isis and the US and Israel. Assad now appears determined to purge the last bastions of rebel control. Idlib province in northwestern Syria, the only other major opposition-held pocket, is sheltering about a million displaced people, doubling its population. Calm returned to southern Israel Saturday, after a violent Friday in which Israel bombarded Hamas targets between 5:30pm and 10:30pm in Gaza in response to the death earlier in the day of an IDF soldier by Palestinian sniper fire along the border. The fallen soldier was identified as 20-year-old St.-Sgt. Aviv Levi from Petah Tikva. His family, which was abroad in Italy at the time of his death, was notified by the IDF, and Levi's name was released to the media on Saturday night. He was killed two weeks before his 21st birthday and three months before the end of his military service. Levi will be buried Sunday at noon at the Petah Tikva-Segula military cemetery. The Givati Brigade soldier, who had been wearing a protective vest, was said to have been hit in the chest by the sniper. Levi was the first soldier to be killed by a Palestinian from the Gaza Strip in four years, since Operation Protective Edge in 2014. Unconfirmed reports in Gaza stated that the leadership of Hamas's military wing ordered the gunfire in revenge for an Izzadin al-Qassam Brigades member, identified by the Gaza European Hospital as 38-year-old Abdul-Karim Radwan, who was killed on Thursday as he was launching incendiary kites. Prime Minister Benjamin Netanyahu expressed his condolences, stating, "Aviv fought with his friends bravely and with determination against the terror from the Gaza Strip. Unfortunately, this struggle sometimes exacts from us an unbearable price. Our hearts go out to the family." An Israeli source said Hamas has suffered "a severe blow" in Friday's retaliatory air strike and "had asked for a cease-fire through the Egyptians" and "had committed to stopping the incendiary terror and the terror along the fence." Egypt has relayed this commitment to Israel, but the facts on the ground will determine what happens next, the source said. "If Hamas violates [this understanding] it will pay a heavy price," the source warned. Another diplomatic source told The Jerusalem Post that evidence of a cessation of hostilities could already be seen in the absence of any violent response to the Israeli air strike. 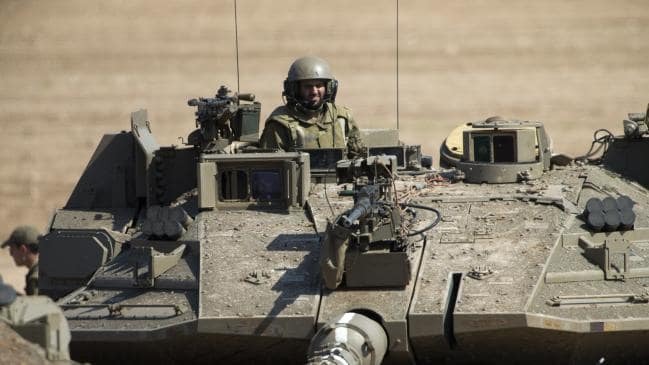 While a cease-fire was reached between Israel and Hamas by midnight, IDF tanks on Saturday morning fired toward a Hamas post in the northern Gaza Strip after a group of Palestinians infiltrated into Israel by breaching the security fence. There were no casualties and the group returned to the Strip. Hamas spokesman Fawzi Barhoum tweeted that the ceasefire was reached "with Egyptian and UN efforts to return to the previous situation of ceasefire between the occupation and Palestinian factions." The IDF had no official comment on the cease-fire announcement but said Saturday morning that residents near the Gaza border could return to their normal schedules. On Saturday evening, Israeli media reported that defence establishment officials believe the sniper fire was not sanctioned by Hamas and that Egyptian officials were enraged by the incident and made the Gazan terrorist group accept the cease-fire with Israel. According to the IDF's Spokesperson's Unit, more than 60 Hamas targets across the coastal enclave were hit, including three battalion headquarters. Other targets included weapons stores, combat equipment warehouses, training areas, observation posts, command and control rooms, a battalion commander's office, and other infrastructure. Four Palestinians were said to have been killed in the retaliatory strikes, three of whom belonged to Hamas. The military said the strikes by fighter jets and tanks came as a response to the sniper fire which killed the soldier in the area of Kibbutz Kissufim. "Hamas will be held accountable for this incident as well as the series of the terror activities it has been executing over the past months," the IDF said in a statement. "Hamas has chosen to escalate the security situation and will bear the responsibility for its actions." The IDF Home Front Command had instructed Israelis living in communities near the Gaza border on Friday afternoon to remain within a 15-second distance from a bomb shelter and to avoid mass gatherings. The army also closed Zikim Beach to the public for the weekend as a precaution. Incoming rocket sirens were activated around 8:30pm on Friday in Gaza periphery communities, with two projectiles intercepted by the Iron Dome missile defence system and a third hitting open territory outside a community in the South. On Friday evening, Defence Minister Avigdor Liberman spoke on the phone with Nickolay Mladenov, UN special coordinator for the Middle East peace process, warning that Hamas was "deliberately deteriorating the situation" and that Hamas would be responsible for any loss of life. "If Hamas continues with the rocket fire, the result will be much harsher than they think, and the responsibility for all the destruction and loss of human life will be on Hamas," Liberman cautioned. Taking to Twitter, Mladenov stated, "The actions of #Hamas, #IslamicJihad & other groups in #Gaza put at risk not only the lives of Israelis & Palestinians alike, but also efforts to ensure a livable future 4 people of Gaza. They must prevent the launching of rockets & breaching of the fence". "Everyone in #Gaza needs to step back from the brink. Not next week. Not tomorrow. Right NOW! Those who want to provoke #Palestinians and #Israelis into another war must not succeed," he added. The Israeli strikes and the launching of the Gazan projectiles came after Prime Minister Benjamin Netanyahu, Liberman, IDF Chief of Staff Lt.-Gen. Gadi Eisenkot, Israel Air Force Commander Maj.-Gen. Amikam Norkin and other top IDF officers met at IDF Headquarters in Tel Aviv for a security assessment. According to the Gaza Health Ministry, two Palestinians were killed near Khan Yunis, with a third being killed east of Rafah. They were identified as Shaaban Abu Khatir, Muhammed Abu Farhana and Mahmoud Qishta. Earlier on Friday, hundreds of Palestinians demonstrated along the border fence in another week of protests. The official Palestinian news agency Wafa reported that at least five Palestinians were injured by live bullets. On Friday morning, Liberman had warned that Hamas is pushing Israel into a wide-scale Gaza war that will be larger in scope than Operation Protective Edge in 2014. "Hamas leaders are forcibly leading us into a situation where we will have no choice, a situation in which we will have to embark on a painful, wide-scale military operation," Liberman said as he visited the southern city of Sderot. "Hamas is responsible for this crisis, but unfortunately it's the Gaza residents that may have to pay the price," he noted. Tensions with Gaza have significantly risen following a flareup of violence last weekend when Hamas launched 200 mortars and rockets into southern Israel, and Israel responded by striking more than 40 Hamas targets across the Gaza Strip. On Thursday, Liberman held a meeting to assess the situation in the South shortly after a Hamas projectile struck southern Israel. The meeting was attended by the IDF chief of staff, the head of military intelligence, the commanders of the Southern Command and Central Command, the Coordinator of Government Activities in the Territories (COGAT) and members of the Shin Bet. The UN Security Council is set to discuss the Gaza escalation on Tuesday, according to the office of Israel's Ambassador to the UN in New York Danny Danon. Danon called on the UNSC to "unequivocally condemn Hamas immediately, which perpetrates violence and terror against Israeli communities, endangering their lives, and holds the entire Palestinian population of Gaza hostage." WASHINGTON: US officials say the Trump administration is staffing up a Middle East policy team at the White House in anticipation of unveiling its long awaited but largely mysterious Israeli-Palestinian peace plan. The agencies declined to comment but an NSC official said that Kushner, Trump's son-in-law and senior adviser, and Greenblatt, Trump's special envoy for international negotiations, "are expanding their team and the resources available as they finalize the details and rollout strategy of the peace initiative." White House officials say the plan will focus on pragmatic details, rather than top-line concepts, that will be able to easier win public support. Yet the Palestinian leadership has been openly hostile to any proposal from the Trump administration, citing what it says is a pro-Israel bias, notably after Trump recognized Jerusalem as Israel's capital in December and moved the US embassy there from Tel Aviv in May. Since the Palestinian Authority and its President Mahmoud Abbas broke off contact after the Jerusalem announcement, the US negotiating team has been talking to independent Palestinian experts. Palestinian alienation has continued to grow as millions of dollars in US assistance remains on hold and appears likely to be cut entirely. With just two months left in the current budget year, less than half of the planned $251 million in US aid planned for the Palestinians in 2018 — $92.8 million — has been released, according to the government's online tracker, www.foreignassistance.gov. The remaining amount is still on hold as is an additional $65 million in frozen US assistance to the UN Relief and Works Agency, which provides services to Palestinians in the West Bank, Gaza, Jordan and Lebanon. In addition, Israel's response to the plan is far from certain. Although Prime Minister Benjamin Netanyahu is one of Trump's top foreign allies, it remains unclear if he will back massive investment in Gaza, which is run by the militant Hamas movement. For the plan to succeed or even survive the starting gate, it will need at least initial buy-in from both Israel and the Palestinians as well as from the Gulf Arab states, which officials say will be asked to substantially bankroll its economic portion. Arab officials have thus far adopted a wait-and-see approach. The officials believe that the hope of a better economic future for the Palestinians coupled with progress on that front, the Palestinians may be willing to delay or modify what have been intractable and to-date unresolvable demands from Israel. Those include the right for Palestinian refugees to return to lands they abandoned or were forced from, the recognition of east Jerusalem as the capital of an independent Palestine. And, they plan to appeal to all sides of the conflict not to let the disagreements of the past hold back their children's futures, according to the officials. Two Palestinians, including a medic, have been killed by Israeli fire on the Gaza border, but away from protests the calm reached after a deadly flare-up between the enclave's rulers Hamas and the Israeli army has mainly held. At least 131 Palestinians were shot by Israeli fire in the protests, Gaza's health ministry said, with volunteer medic Abdullah al-Qatati killed after being hit in the chest east of Rafah in southern Gaza on Friday. Relatives of the 21-year-old medic gathered in the morgue of a hospital in Khan Yunis where his body lay, while outside his colleagues mourned. A 55-year-old Palestinian, Ali al-Alul, was killed by Israeli fire on the same stretch of the border. A few thousand protesters had gathered in different locations along the border with Israel, setting tyres ablaze and throwing stones, but there were fewer people demonstrating than in previous weeks, AFP correspondents said. In Friday's demonstrations a total of 307 people were wounded, some by tear gas, including two journalists and five medics. The protests came after a deal to end all rocket fire into Israel and air strikes on the Gaza Strip appeared to go into effect around midnight Thursday (Israel time). There was no official confirmation from Israel or Gaza's Islamist rulers Hamas but there were no fresh strikes Friday. Thursday had seen extensive Israeli raids in retaliation for the launching of more than 180 rockets and mortar rounds by Hamas and its allies on Wednesday night. Three Palestinians were killed in the Israeli strikes, including a pregnant woman and her 18-month-old daughter, while seven Israelis were wounded by Palestinian rocket fire as hundreds took refuge in bomb shelters. The European Union on Friday said "the death of the pregnant Palestinian mother and her child in this latest escalation is a tragic loss". It was one of the most serious escalation since the 2014 Gaza war and followed months of rising tensions. Late on Thursday, an Israeli air raid flattened a five-storey building which hosted a cultural centre in Gaza City but which the army said was used by Hamas security forces. The Israeli security cabinet and the Hamas leadership met separately on Thursday, with the truce offer brokered by Egypt and the United Nations on the table. Neither Israel nor Hamas officially confirmed any truce had gone into effect, although that has also been the case with previous informal arrangements. It would be the third such truce in a month. Reserve General Doron Almog, former head of Israel's southern command which deals with Gaza, told army radio on Friday morning that the next 24 hours would be crucial. "We are closer to an arrangement than we have been in the past because Hamas's interest in a deal is greater than its wish for escalation," he said. The European Union said Gaza and Israel are "dangerously close" to a new conflict, calling for urgent "de-escalation" to keep civilians from further risk. The Israeli daily Maariv wrote that during the security cabinet meeting on Thursday Defence Minister Avigdor Lieberman was a lone voice in support of a new war in Gaza. "He was the only one who demanded to launch a large-scale operation in the GazaStrip. Netanyahu was opposed. The (Israeli army) also didn't recommend it," he said. Washington: The Trump administration announced on Monday that it would close the Palestine Liberation Organisation's office in Washington, following a statement by administration officials Sunday night (US time), widening a US campaign of pressure amid stalled Middle East peace efforts. "The United States will always stand with our friend and ally, Israel," National Security Adviser John Bolton said in his prepared remarks. "The Trump administration will not keep the office open when the Palestinians refuse to take steps to start direct and meaningful negotiations with Israel." 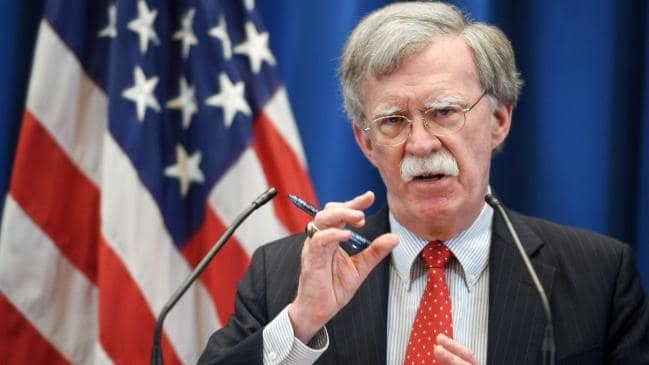 In his address to the conservative Federalist Society at midday on Monday, Mr Bolton also threatened to impose sanctions against the International Criminal Court if it moved ahead with investigations of the US and Israel. "If the court comes after us, Israel or other allies, we will not sit quietly," he said. Among the responses, Mr Bolton said, the US would ban ICC judges and prosecutors from entering the country. "We will sanction their funds in the US financial system, and we will prosecute them in the US criminal system. We will do the same for any company or state that assists an ICC investigation of Americans." The PLO office in Washington has long been the focus of controversy. The Trump administration warned last year it might close the office after Palestinian Authority president Mahmoud Abbas called for the investigation and prosecution of Israeli officials by the ICC. Palestinian negotiator Saeb Erekat said at the time such a move would undermine prospects for peace. The PLO opened its mission in Washington in 1994 and joined the ICC after receiving observer state status at the UN in 2012. Explaining the decision to close the PLO office, Mr Bolton said that it reflected longstanding congressional concerns with Palestinian efforts to prompt an ICC investigation of Israel. The closure, which was formally announced by the State Department, followed other steps by the administration that have angered Palestinians, including moving the US embassy to Jerusalem from Tel Aviv and ending funding of $US200 million ($281m) for the UN agency that helps Palestinian refugees. The administration also planned to change unilaterally the definition of a Palestinian refugee and slash the number it recognises from 5.5 million to 500,000. The proposal was drafted by Donald Trump's son-in-law and Middle East adviser Jarded Kushner in a bid to shock peace talks back to life. In his speech, Mr Bolton said the administration was still committed to negotiating a peace accord between Israel and the Palestinians. "The United States supports a direct and robust peace process, and we will not allow the ICC, or any other organisation, to constrain Israel's right to self-defence," he said. In the US, the ICC has long been the bane of conservatives, including Mr Bolton, who consider it biased against the US and a danger to US sovereignty. A particular concern has been a request last year by the ICC prosecutor to investigate US military and CIA personnel who served in Afghanistan for alleged detainee abuse. In the speech, Mr Bolton called the Hague-based rights body "unaccountable" and "outright dangerous" to the United States, Israel and other allies, and said any probe of US service members would be "an utterly unfounded, unjustifiable investigation." He offered an extended critique of the court, which he asserted was rife with abuses, and vowed that the US would use "any means necessary" to protect American citizens and those of friendly allies from prosecution by the court. If the court moves against the US or its allies, he said, the administration will negotiate binding agreements to prohibit other nations from turning over US citizens to the court. Nations that co-operate with ICC investigations of the US and its allies will also risk losing foreign aid and military assistance, he stated. Other responses, he warned, include economic sanctions against the court itself. The US, he said, also will consider asking the UN Security Council to constrain the court's authority. Donald Trump has thrown his support behind Scott Morrison's new Middle East policy. Picture: AP. Washington: The Trump administration has strongly backed the Morrison Government's new Middle East policy, including the possible relocation of Australia's embassy in Israel from Tel Aviv to Jerusalem, as announced in the Australian on Tuesday morning. "We welcome and strongly support Australia's review and discussions on relocating its embassy, seeking a better deal with Iran, and increasing engagement with Israel," a White House official told The Australian today. The official added "We appreciate Australia's decision to vote no on the UN resolution," in reference to Australia's decision to oppose a resolution for the Palestinian Authority to chair a group of developing nations known as the G77. But the shift in Coalition policy was criticised in New York today by the Permanent Observer of Palestine to the United Nations, Riyad Mansour, who said it would be in breach of UN resolutions and global consensus. "Recent statements from Australia on Jerusalem and on possible move of Australia's Embassy to the City are disappointing and regrettable," Dr Mansour told The Australian. "But more so, such actions would breach UN Security Council resolutions. "It is our hope that Australia, a long-time champion of international law, will abandon the kind of negative approach being currently reported and will instead respect international law and Security Council resolutions and remain part of the international consensus on these very critical and sensitive matters," he said. Any final decision to move Australia's embassy to Jerusalem would be a coup for the White House, making Australia only the third country behind the US and Guatemala to make the move. The embassy shift is contentious because it would effectively recognise Jerusalem as Israel's capital despite the disputed status of the city in any future peace deal. Mr Trump has said that recognising Jerusalem as Israel's capital is merely a statement of the obvious. Prime Minister Scott Morrison says he has not discussed with Donald Trump the possible embassy move to Jerusalem and says it was not made at the request of the United States. "I have made this decision without any reference to the United States. It has not come up in any discussion I have had with the president or with officials," Mr Morrison said. "There has been no request, and there has been no discussion with the United States. "Australia makes its decisions about its foreign policy independently. We do so in our own national interests consistent with our own beliefs and our own values." Israeli Prime Minister Benjamin Netanyahu says he will take on the defence minister portfolio, rejecting calls to dissolve his government even as early elections appeared increasingly likely. Netanyahu says heading to elections now, amid repeated violent confrontations with Gaza militants, was "irresponsible" of his coalition partners. They have been pushing for early polls since the resignation last week of Defence Minister Avigdor Lieberman over a Gaza cease-fire. "Today, I take on for the first time the position of defence minister," said Netanyahu, speaking from Israel's defence headquarters in Tel Aviv in a statement broadcast live at the top of the evening newscasts on Sunday. "We are in one of the most complex security situations and during a period like this, you don't topple a government. During a period like this you don't go to elections," he said. The sudden coalition crisis was sparked by the resignation of the hawkish Lieberman, who had demanded a far stronger response last week to the most massive wave of rocket attacks on Israel since the 2014 Israel-Hamas war. He alleges the cease-fire agreement reached with Gaza's Hamas rulers will put southern Israel under a growing threat from the group, similar to that posed to northern Israel by Lebanon's heavily armed Hezbollah group. The departure of Lieberman and his Yisrael Beitenu party leaves the coalition with a one-seat majority in the 120-member parliament. Netanyahu's other partners say that makes governing untenable and would leave the coalition susceptible to the extortion of any single member until elections scheduled for November 2019. Education Minister Naftali Bennett, of the pro-settler Jewish Home party, has already threatened to bring down the government if he is not appointed defence minister. He and Justice Minister Ayelet Shaked, also of Jewish Home, are set to deliver a statement to the media on Monday (today). If the party leaves the coalition, it would strip Netanyahu of his parliamentary majority. Finance Minister Moshe Kahlon, another senior partner, says another year of such instability will harm the economy. A meeting between him and Netanyahu on Sunday that was meant to convince Kahlon to stay ended with no results. No Israeli government has served out its full term since 1988. Most opinion polls show Netanyahu easily securing re-election, which would secure him a place in Israeli history as the country's longest serving leader. But several factors could trip him up, including a potential corruption indictment that could knock him out of contention. Police have recommended he be indicted on bribery and breach of trust charges in two cases and have questioned him at length on another. The country has long been eagerly awaiting the attorney general's decision on whether to press charges. Netanyahu has angrily dismissed the accusations against him, characterising them as part of a media-driven witch-hunt that is obsessed with removing him from office. Israel's government has called an early election with Prime Minister Benjamin Netanyahu struggling to hold a one-seat majority in parliament as he also faces potential corruption charges. Despite Mr Netanyahu's legal and political troubles, polls have indicated he would remain prime minister after new elections, putting him in line to become Israel's longest-serving prime minister. Heads of parties in Mr Netanyahu's coalition agreed to hold the polls in April "in the name of budgetary and national responsibility", a statement issued on their behalf said yesterday. The government was preparing to dissolve the Knesset and hold elections on April 9, Justice Minister Ayelet Shaked said. Elections were not due until November, but there has been speculation the coalition would not last that long. Mr Netanyahu laid out what he saw as his achievements and said he hoped for a similar coalition to the current one, seen as the most right-wing in Israel's history. "We ask for a clear mandate from the voter to continue to lead the state of Israel in our own way," he said. The decision comes with the coalition struggling to agree on a key bill related to ultra-Orthodox Jews serving in the military like their secular counterparts. Ultra-Orthodox parties hold 13 seats out of the coalition's 61, giving them significant influence. Mr Netanyahu's coalition was left with a one-seat majority after defence minister Avigdor Lieberman stepped down last month over a Gaza ceasefire deal. His resignation cost the coalition five seats. At the time, Mr Netanyahu worked to rescue the coalition and managed to keep it on track for weeks as he faced criticism over the Gaza truce. He said elections then would be irresponsible due to the sensitive security situation facing the country — an apparent reference to an upcoming military operation to destroy Hezbollah tunnels from Lebanon announced earlier this month. Asked yesterday about argument against elections, he said the tunnel operation was nearly complete. Opposition leader Tzipi Livni and Labour Party chairman Avi Gabbay, part of the Zionist Union alliance, welcomed new elections. "Hope is returning to Israel today and you can breathe a sigh of relief," Ms Livni said. "On his way out, Netanyahu will try to destroy what is left of Israeli democracy and we will stand as a wall against any such attempt." Police have recommended Mr Netanyahu's indictment in three corruption probes and the Attorney-General is considering how to proceed. He is, however, not required to step down if indicted — only if he is convicted with all appeals exhausted — and polls have indicated his Likud party would remain the largest in parliament after new elections. Some analysts say he would be better positioned to face potential charges with a fresh mandate. However, Finance Minister Moshe Kahlon of the centre-right Kulanu party says he believes any prime minister should resign if indicted. Mr Netanyahu has been prime minister for a total of more than 12 years, from 1996 to 1999 and again since 2009. He could next year surpass the record set by founding father David Ben-Gurion, who spent more than 13 years in office. The campaign is sure to be tumultuous, with Mr Netanyahu's opponents seeking to erode his reputation as Israel's "Mr Security". Although his credentials took a hit over the Gaza ceasefire, Israel's opposition has been in disarray and may find it difficult to mount a serious challenge. Mr Netanyahu has benefited from strong backing by Donald Trump. A senior White House official said as a result of the election the Trump administration was evaluating when it would publish its long-awaited Middle East peace plan. "The upcoming election in Israel on April 9 is one of many factors the administration is considering in evaluating the timing of the release of the peace plan," the official said. Hosting a senior aide to US President Donald Trump in Jerusalem, Prime Minister Benjamin Netanyahu on Sunday called on the administration to recognize Israeli sovereignty over the Golan Heights. "The Golan Heights is tremendously important for our security," Netanyahu told US National Security Adviser John Bolton, during a joint statement after their meeting at the Prime Minister's Residence on Balfour Street. Netanyahu said he was planning to take Bolton on a tour of the Golan Heights, weather permitting. "When you're there, you'll be able to understand perfectly why we'll never leave the Golan Heights and why it's important that all countries recognize Israel's sovereignty over the Golan Heights," he said. "I've discussed this with the president, and I hope I have a chance to to show it to you directly tomorrow on our visit." Israel captured the Golan from Syria during the 1967 Six Day War and subsequently annexed it, in a move not recognized by the international community. In light of the civil war in Syria, Israel has in recent years stepped up its calls on friendly governments to recognize that Israel will never return the strategically important territory to the Assad regime, but so far no country has done so. Standing next to Bolton, Netanyahu praised Trump for recognizing Jerusalem as Israel's capital, for withdrawing from the Iran nuclear deal and for standing up for the Jewish state in international forums. "You have backed, both in word and deed, Israel's right to defend itself, which we exercise constantly," the prime minister said. "It's important to know that we have the backing of our great friend and ally, the United States of America." Bolton, speaking after Netanyahu, reassured Israel of Washington's abiding support for Israel's security, seeking to allay fears of increasing Iranian aggression after US troops are pulled out from Syria. The US will withdraw its forces from northeastern Syria "in a way that makes sure that ISIS is defeated and is not able to revive itself and to become a threat again; and to make sure that the defence of Israel and our other friends in the region is absolutely assured; and to take care of those who fought with us against ISIS and other terrorist groups," Bolton said, using an acronym for the radical Islamic State group. For the US, a sovereign nation's ability to defend itself is the "ultimate mark of sovereignty," he added, stressing that Trump has repeatedly backed Israel's right to self-defence. "He says it proudly and unequivocally," Bolton declared. "And I would just say to any nation, whether in this region or not in this region, that has any doubt about America's support for Israel's right to self-defence — they better think about it again." Bolton also briefly addressed Iran's ongoing nuclear ambitions. "We've got the continuing threat of Iran's quest for deliverable nuclear weapons. And despite getting out of the Iran nuclear deal, despite the sanctions, we have little doubt that Iran's leadership is still strategically committed to achieving deliverable nuclear weapons," he said, standing next to Netanyahu. "The US and Israel are strategically committed to making sure that doesn't happen." Earlier on Sunday, Bolton said there was no timetable for the pullout of American forces in northeastern Syria, but insisted it was not an unlimited commitment. "There are objectives that we want to accomplish that condition the withdrawal," Bolton told reporters in Jerusalem. "The timetable flows from the policy decisions that we need to implement." Those conditions, he said, included the defeat of remnants of IS in Syria, and protections for Kurdish militias who have fought alongside US troops against the extremist group. Bolton's comments mark the first public confirmation that the drawdown has been slowed, as Trump faced widespread criticism from allies and the resignation of US defence secretary Jim Mattis, for a policy that was to have been conducted within weeks. During his meeting with Netanyahu, Bolton was expected to explain that some US troops based in Syria to fight IS will shift to Iraq with the same mission and that the al-Tanf base would remain. In an extraordinary statement, the Israeli military confirmed early Monday morning (Israeli time) it was attacking Iranian targets in Syria, after carrying out a rare daylight air raid (on Sunday) near the Damascus International Airport. The statement was issued hours after Israeli missile defences intercepted an incoming missile over the Golan Heights in the wake of the airport raid. Until now Israel has largely refrained from public admissions of its covert military operations in neighbouring Syria, in order to avoid large-scale involvement in the eight-year civil war. The Syrian military said Israel carried out airstrikes with successive waves of guided missiles soon after 1am Monday morning (Israeli time), but added that Syrian air defences destroyed most of the missiles before they reached their targets. The Israeli military had initially declined to comment on the Damascus airport strike, though it said a rocket fired at the Golan Heights was intercepted by Israel's Iron Dome defence system. Israeli warplanes have used Lebanon's airspace to strike deep inside Syria, including attacking a warehouse near Damascus airport earlier this month. Two hours after the reports that Israel's Iron Dome intercepted a rocket fired toward the Golan Heights, Mr Netanyahu, who is on a visit to Chad, said: "We have a defined policy: to harm Iranian entrenchment in Syria and to harm anyone who tries to harm us." Earlier Sunday, a roadside bomb went off south of Damascus without causing casualties, state media reported. The SANA news agency said the blast targeted a military checkpoint on a main highway during peak hour. The Britain-based Syrian Observatory for Human Rights, which closely monitors Syria's war, said the bomb targeted the vehicle of a "security personality" that it did not identify. "It was not a random act," he said. The former US envoy to the US-led coalition against Islamic State, Brett McGurk said the US had no plan for Syria as it proceeds with Donald Trump's order to pull America's 2000 troops out of the country. Mr McGurk and defence secretary Jim Mattis quit over the decision. "The President has made that clear — we are leaving. And that means our force should be really with one mission: to get out and get out safely," he told CBS "Face the Nation". But he added "Right now we do not have a plan. It increases the vulnerability of our force … It is increasing the risk to our people on the ground in Syria and will open up space for ISIS." Mr McGurk said the US cannot expect "a partner" such as Turkey to take its place. "That is not realistic. And if our forces are under order to withdraw, as at the same time they are trying to find some formula for another coalition partner to come in, that is not workable. That is not a viable plan," he said. Last Wednesday an ISIS suicide bomber killed four Americans and 15 others in the north Syrian town of Manbij. It was the deadliest attack to hit US troops since they deployed to Syria in 2014. Israel and Iran are now in open and direct conflict in Syria. The two countries have been engaged in a shadow war for years, with Israel secretly targeting assets of Iran and its proxy Hezbollah. What has changed over the weekend is the overt nature of their confrontation. Israel and Iran carried out daylight air and missile strikes on each other on Sunday, and Israel for the first time acknowledged that it was attacking bases of Iran's expeditionary al-Quds Brigade, in real time, in the early hours of yesterday. Both sides seem motivated, at least partly, by the vacuum that now exists in Syria. The Assad regime is more secure in Damascus but hardly in control of most of the war-torn country. Islamic State, which three years ago held much of northern Syria, has lost nearly all its strongholds. Iran seized the opportunity to establish permanent bases on Syrian soil, completing its "Shia Crescent" land corridor leading all the way from Tehran, through Iraq and Syria, to Beirut and the Mediterranean coast. Israel attacked Iranian targets in Syria, without taking responsibility, while hoping that Russia and the US would also rein in Iran. Russia, however, does not seem inclined to oblige and President Donald Trump has announced a rapid and full withdrawal of US forces from Syria. Israel is left facing Iran on its own. The intensifying conflict has political ramifications. Israeli Prime Minister Benjamin Netanyahu, who is also Defence Minister, is fighting an election in which his suitability to remain in office, in the light of impending corruption charges, has become the main issue. Netanyahu is anxious to prove to Israeli voters that whatever the allegations against him, he is the best person to lead the country in a turbulent region. That does not mean he will go to war with Iran just for votes, but he may be more inclined to publicise Israel's air strikes during the campaign, creating more pressure on Iran to retaliate. Meanwhile, in Tehran, the mastermind behind Iran's Syrian strategy, General Qassem Soleimani, is caught up in a power struggle of his own. President Hasaan Rouhani is opposed to wasting more money on foreign adventures when sanctions have helped to push Iran's economy to the brink. Soleimani still has the support of Ayatollah Ali Khamenei, the supreme leader, but his forces in Syria have been publicly humiliated by the Israeli strikes and he needs some success against Israel for his own political survival. With Israel and Iran on a collision course in Syria, the concern in the region is that the conflict could spill over to other countries. The most obvious candidate for escalation is Lebanon, where Iran's main proxy has more than 100,000 Iranian-made missiles aimed at Israel. Iran is trying to enhance these missiles' range and accuracy. Israel sees Hezbollah's receipt of missiles that could hit specific targets within its territory as justification for going to war. None of the players — Israel, Iran, Hezbollah — want to go all the way at present, but they are on a slippery slope to all-out war. Prime Minister Benjamin Netanyahu vowed yesterday to freeze money transfers by Israel to the Palestinian Authority after a deadly Palestinian attack on a young woman. Israel collects about $US127 million a month in Customs duties levied on goods destined for Palestinian markets that transit through Israeli ports and then transfers it to the PA. The Knesset last year passed legislation to partially withhold funds, in response to PA payments to families of Palestinians jailed by Israel for attacks on Israelis. "By the end of the week, the staff-work necessary for implementing the law on deducting terrorists' salaries will be completed," Mr Netanyahu — who faces a general election in April — said at the start of the weekly cabinet meeting. "Next Sunday I will convene the security cabinet and we will approve the necessary decision to deduct the funds. Let nobody doubt, the funds will be deducted at the start of next week." Education Minister Naftali Bennett was among right-wingers who pressed Mr Netanyahu to implement the law after a Palestinian was arrested over the murder of 19-year-old Ori Ansbacher. "The law to offset terrorist funds passed … last July," he tweeted. "I call on the prime minister — apply the law immediately." Palestinian Civil Affairs Minister Hussein al-Sheikh said the PA would not go along with Israel withholding any part of the tax money due. "The Palestinian Authority will refuse to receive any cleared funds if Israel deducts a penny from it," he said. The Israeli army said it had started preparations to demolish the West Bank home of the Palestinian suspected of Ansbacher's killing, named as 29-year-old Arafat Irfaiya from the flashpoint city of Hebron on the West Bank. "Overnight, troops operated in Hebron, where the suspect in the murder of Ori Ansbacher is from," the army said. "During the operation, the troops surveyed the suspect's house in order to examine the possibility of its demolition." Ansbacher's body was found late on Thursday in southeast Jerusalem, and she was buried the next day in her Israeli settlement of Tekoa. Israeli security forces arrested the suspect in a raid in the West Bank city of Ramallah. The Shin Bet domestic security agency said the murderer had "nationalist" motives. Mr Netanyahu visited Ansbacher's parents to inform them of the finding. The police and Shin Bet said previously that investigations had not concluded whether it was a "terrorist attack" or driven by another motive. But in the run-up to the elections, politicians and Israeli media appeared to have already made up their minds. "I have no doubts about the nationalist motives of the murderer," said Public Security Minister Gilad Erdan. Commenting on calls to execute Palestinian militant killers, Mr Erdan said he was in favour of applying the death penalty in certain circumstances. "If it becomes clear that there is no possibility of rehabilitating the murderer and that he abused his victim, in such cases capital punishment should be applied," he said. The Maariv newspaper quoted MP Bezalel Smotrich of the far-right Jewish Home party as saying: "The time has come to employ the death penalty for terrorists, as the law allows us to do." Despite a court gag order, Israeli social media was abuzz over the weekend with what the Yediot Aharonot newspaper called "graphic descriptions about the alleged nature of the murder". Police called on the public not to share "publications and reports, especially on social media, about the circumstances of the murder case — including irresponsible horrific descriptions". "We hereby clarify that those are completely baseless publications," they said. Sponsors of July's law on Palestinian funds wrote at the time that the PA paid about $US330m a year to prisoners and their families, or 7 per cent of its budget. Israel has withheld payments in the past, notably in response to the Palestinians' 2011 admission to the UN cultural agency UNESCO as a full member. The PA, which has limited sovereignty in parts of the West Bank, relies heavily on outside financial aid. Donald Trump and Israeli Prime Minister Benjamin Netanyahu hold up the signed proclamation. Picture: AP. Donald Trump has signed a proclamation recognising the disputed Golan Heights as Israeli territory in a move described as "a historic day," by Israel's Prime Minister Benjamin Netanyahu. The signing ceremony at the White House today, which reverses a long-standing plank of US Middle East policy, came as Israel retaliated against militants in Gaza after a rocket strike from the territory struck a house in central Israel injuring seven people. "As we speak, Israel is responding forcefully to this wanton aggression," said Mr Netanyahu who has cut short his visit to the US to return home in response to the attack. Mr Trump said it was vital for Israel's security that the US recognise Israeli sovereignty over the strategic western Golan Heights which were captured from Syria in the Six-Day War of 1967 and annexed by Israel in 1981. "Today, aggressive acts by Iran and terrorist groups, including Hezbollah, in southern Syria continue to make the Golan Heights a potential launching ground for attacks on Israel," Mr Trump said in the proclamation. "Israel is an inspiration and trusted ally and a cherished friend, the US will always stand by its side," the president said. Mr Netanyahu said Israel had never had a better friend that Mr Trump. "(This) comes at a time when the Golan is more important than ever for our security when Iran is trying to establish bases in Syria to strike at our territory," he said. The Golan Heights is viewed by the international community, including the United Nations, as occupied territory so Mr Trump's call to recognise it as a part of Israel is important symbolically. Syria denounced Mrs Trump's move as "blatant aggression" on its sovereignty and territorial integrity. Lebanon, which Secretary of State Mike Pence visited over the past weekend, said the Golan Heights are "Syrian Arab" territory and that "no country can falsify history by transferring" land from one country to another. Jerusalem: Israeli forces continued striking targets across the Gaza Strip yesterday in response to a surprise rocket attack from the Palestinian territory. The military bolstered its troops and rocket-defence systems in anticipation of a new round of heavy fighting with Islamic milit�ant group Hamas. Israel opened public bomb shelters in most major cities, and civil defence authorities cancelled sports events and public transport�ation in southern Israel. The Israeli army said at least 30 rockets had been fired into Israel, as air-raid sirens wailed across the south of the country late on Monday night. The army said nearly all of the rockets were either intercepted or landed in open areas. "Israel will not tolerate this. I will not tolerate this," Prime Minister Benjamin Netanyahu declared during a White House meeting with US President Donald Trump. "Israel is responding forcefully to this wanton aggression. We will do whatever we must do to defend our people and defend our state." Hamas announced that a ceasefire had been brokered by Egyptian mediators on Monday night, but renewed rocket fire in Gaza and air-raid sirens in southern Israel were heard shortly after. The Israeli military said it had retaliated to the latest rocket attacks with 15 airstrikes, hitting Hamas military sites, including the office of its supreme leader. The Israeli military confirmed the bombing, saying the building had "served as an office for many military meetings". An earlier blast destroyed a multi-story building in Gaza City that Israel said had served as a Hamas military intelligence headquarters. There were no immediate reports of casualties. Gaza's Health Ministry said seven Palestinians were injured in the fresh bombings. The sudden conflagration came at a time when Mr Netanyahu and his Hamas foes are in desperate situations. The Prime Minister is in a tight race for re-election, and just two weeks before the April 9 vote faces tough criticism from challengers who accuse him of being too soft on Hamas. Hamas leader Ismail Haniyeh warned Israel against heavy retaliation, saying that Palestinians "will not surrender" and its militant factions "will deter the enemy if it exceeds the red lines". In Beirut, the powerful Lebanese militant group Hezbollah said its leader, Hassan Nasrallah, met a senior Hamas delegation on Monday. Hezbollah said they had discussed the Gaza situation and "Israeli aggression". Hamas is facing perhaps its toughest domestic test since seizing control of Gaza from the rival Palestinian Authority 12 years ago. An Israel-Egyptian blockade, imposed to weaken Hamas, combined with sanctions by the Palestinian Authority and mismanagement by the Hamas government, have all fuelled an economic crisis that has left Gaza with an unemployment rate above 50 per cent. Weekly Hamas protests along the Israeli border for the past year have left about 190 people dead. New York: Syria asked the UN Security Council yesterday to hold an urgent meeting on the US decision to recognise the Golan Heights as Israeli territory. 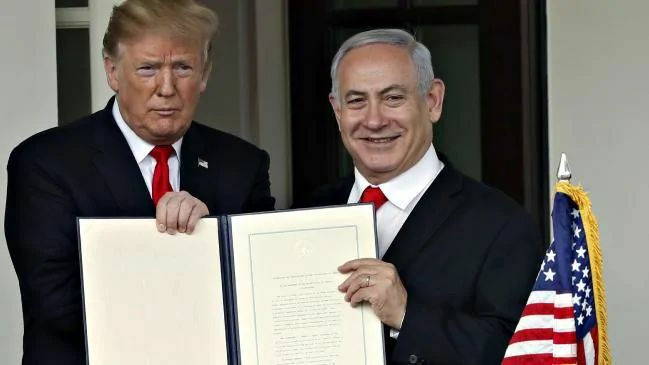 Donald Trump signed a proclamation on Tuesday in which the US recognised Israel's annexation of the strategic plateau despite UN resolutions calling for Israel's withdrawal from the Golan. The diplomatic appeal came as the Israeli army bombed targets in the Gaza Strip and bolstered its forces along the frontier as a truce with the territory's Hamas rulers showed signs of unravelling. Palestinian militants responded with a new barrage of rocket fire, setting the stage for a fresh round of fighting before Israel's national elections on April 9. The violence is likely to become a major theme in the final stretch of a tight re-election campaign for Prime Minister Benjamin Netanyahu. He cut short a visit to the US and rushed back to Israel to deal with the crisis. After meeting with the Prime Minister, military chief Aviv Kohavi ordered an additional troop build-up along the border. Mr Netanyahu had been scheduled to give a speech in Washington to the American Israel Public Affairs Committee. Instead, he addressed the group by satellite, telling it that over the previous 24 hours Israel had pounded militant sites in Gaza on a scale not seen since a 2014 war with Hamas. "I can tell you, we are prepared to do a lot more," he said. "We will do what is necessary to defend our people and to defend our state." Tuesday night's airstrikes came in response to a lone rocket attack. The military said it hit a Hamas military compound and a weapons manufacturing warehouse in southern Gaza. Militants responded by firing another rocket. Israel said both projectiles landed harmlessly in open areas. The sudden burst of late-night fighting ended a day-long lull that had raised hopes of a ceasefire taking hold. On Friday, Syria urged the Security Council to uphold resolutions demanding Israel withdraw from the Golan. The council is scheduled to discuss the crisis today during a meeting on renewing the mandate of the UN peacekeeping force deployed between Israel and Syria in the Golan. The head of the Lebanese Shia movement Hezbollah, a Syrian ally, called for resistance against the US decision. Hassan Nasrallah said the only option left to Syrians to take back their land and for Palestinians to achieve their "legitimate rights" — was "resistance, resistance, and resistance." He described Mr Trump's move as "a crucial turning point in the history of the Arab-Israeli conflict". Mr Trump's decision dealt a "knockout punch" to the peace process built on the concept of land in exchange for peace, Mr Nasrallah said in a televised address. Two of Washington's closest allies — Britain and France — joined Belgium, Germany and Poland to declare that the European position had not changed and that the Golan remained �Israeli-occupied Syrian territory, in line with international law �enshrined in UN resolutions. US acting ambassador Jonathan Cohen told a council meeting on the Middle East that Washington had made the decision to stand up to Syrian dictator Bashar al-Assad and Iran. "To allow the Golan Heights to be controlled by the likes of the Syrian and Iranian regimes would turn a blind eye to the atrocities of the Assad regime and malign and destabilising presence of Iran in the region," Mr Cohen said. He added that there "can be no peace agreement that does not satisfactorily address Israel's security needs in the Golan Heights". China and Russia spoke out against the US decision, as did Indonesia and South Africa, two countries that strongly support the Palestinians, along with Kuwait, a US ally in the region.